Experience 43 years of tradition when you play in the footsteps golf legends. Arnold Palmer, Tom Watson and Davis Love III are among the many greats of the game to claim victory at the historic PGA TOUR event held annually on The Sea Pines Resort’s renowned Harbour Town Golf Links. 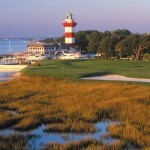 Choose from a variety of golf packages and play any or all of The Sea Pines Resort’s three premier courses, each with its own signature character. Experience Harbour Town Golf Links, which was named one of the top 20 courses in the country by Golf Digest and Golfweek, and named by Golf Digest as one of “America’s 100 Greatest Courses You Can Play” and one of the “75 Best Golf Resorts in North America.” Legendary golf course architect Pete Dye led a multi-million dollar redesign project to create The Sea Pines Resort’s newest golf course, Heron Point by Pete Dye. Play the timeless Ocean Course, which was recently renovated by Mark McCumber and showcases a panoramic ocean view, deep bunkers and lagoons. All three courses have achieved designation as a Certified Audubon Cooperative Sanctuary.